If you are pondering where to fly next, Cumbernauld should be on your shortlist. I visited yesterday and found it friendly, relaxed and a very pleasant place to be. Light winds and clear blue skies provided the perfect conditions for flying and photography alike. Club pilots, student pilots and commercial helicopter crews were all busy with their respective tasks and the immediate reward of stunning views over the Campsie Fells, Stirling and the Forth valley. I am confident that Cumbernauld will continue to thrive as its location makes for a great base for Glasgow and west central Scotland. There are two helicopter charter companies base there and two flying clubs which provide fixed wing flying lessons. This is also the base for Hebridean Air Services, which I hope to feature very soon. Their flights to the Highlands and Islands along with their charter services make them in my opinion one of the most exciting aviation companies around. 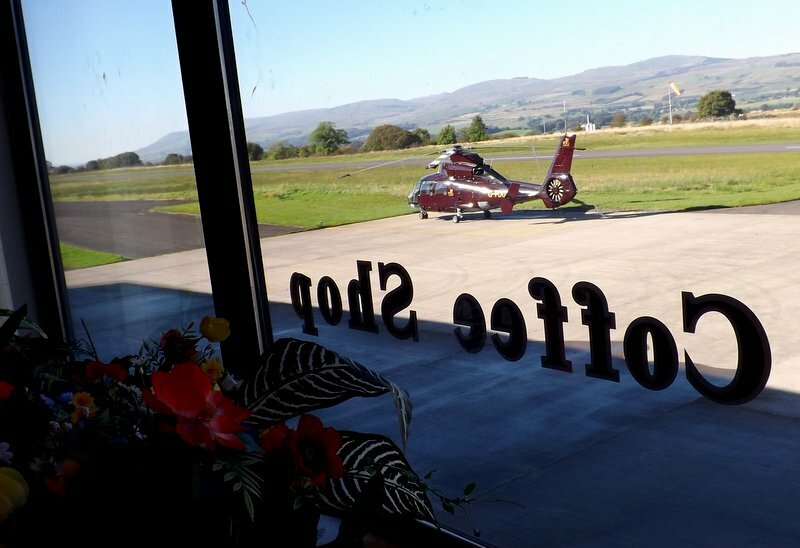 There is a great little cafe on site serving tasty, freshly cooked food with a commanding view of the airfield, only surpassed by the control tower. Having a comfortable lounge area with decent catering is important for a visiting pilot as it is not just the aircraft that needs refueling. Many small airports have nothing for miles around so a hot drink may only be available courtesy of a staff member if you can find one or a friendly spotter with a flask. A "Humble Instructor" from Border Air Training kindly showed me up to the tower Ops team who were very helpful despite it being lunchtime! Thank you Marion and Agostino, (I hope I spelled that right mate...) for the information you gave me, I look forward to seeing those pictures you promised. Likewise I hope to hear from young Neil who was on a work experience placement in the tower. Good luck with your studies. Neil Jamieson, Operations Manager from Heli Air was kind enough to take time out to show me round their new facility, including their brand new, disturbingly engaging helicopter simulator. 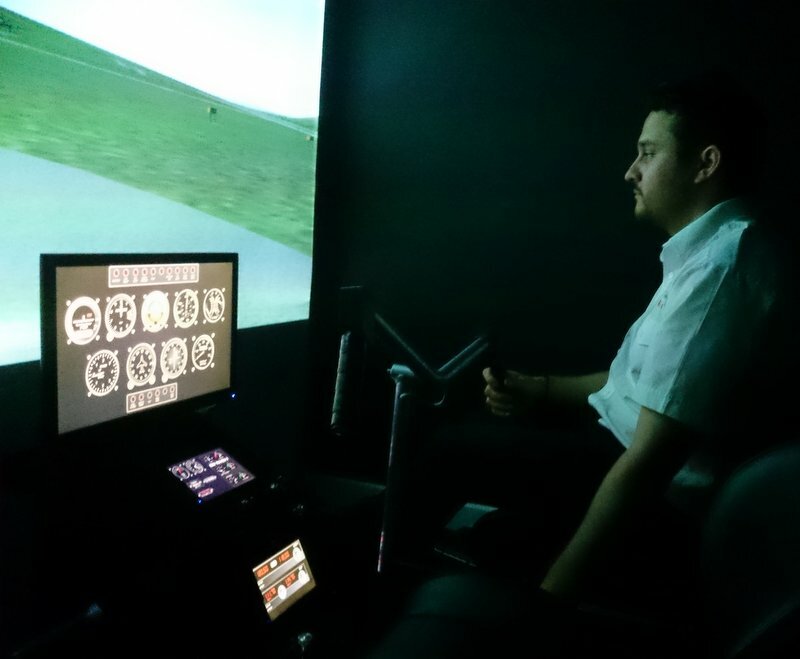 One of only a handful in the UK, the simulator can mimic their fleet of Robinson Helicopters, R22, R44 and R66 providing realistic training regardless of weather and at significantly reduced cost. I managed a short "flight" around the airport but my return to earth would have been very dramatic had it been the real thing. I've only had control of a helicopter once before and that did not include any instructions on how to land, so I'm OK with it. Thanks Neil. One of Heli Air R22s scarpers off from Cumbernauld. www.HeliAir.com This is a non affiliate link as a thank you for supporting PilotScotland.